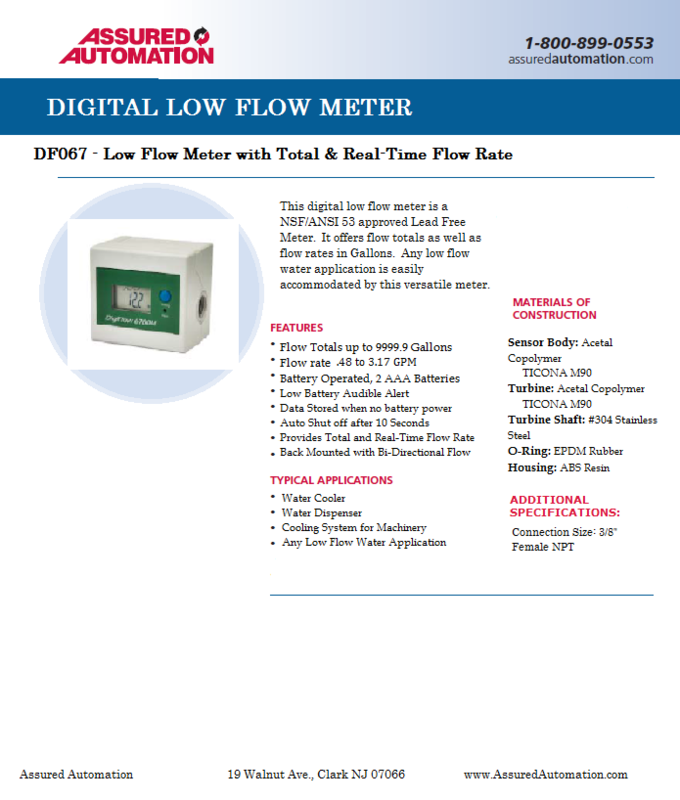 This digital low flow meter offers flow totals as well as flow rates in Gallons. Any low flow water application is easily accommodated by this versatile meter. replace filters. I kind of wish I would have purchased the DFO86. That meter can be programmed so it would have told me when it was time but the one I got works just fine and it will tell me what I need to know. Handy low flow meter, display is not very dark but still readable. Full disclosure - I just received unit and have only tested it for flow.. I have NOT tested it under pressure conditions or for any length of time. However, under cursory testing, I am very please. The unit actually measures flow considerably outside the published flow range of .4-3.0 GPM. I have not verified the accuracy outside this range, but it measured flow as low as .15 GPM to well over 6.0 GPM. If accuracy turns out to be within 15-20%, (and if it doesn't leak long term under say 60 PSI) I will be extremely satisfied. Fast shipping, unit works great.